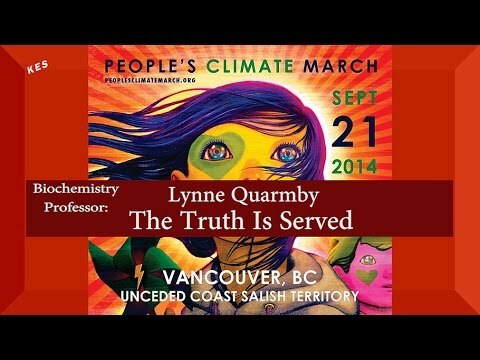 Please watch on YouTube Direct, the video quality on this locations is horrendous most of the time: Lynne Quarmby a biochemistry professor speaking as a citizen & a scientist who currently is the Head of the Department of Molecular Biology & Biochemistry at Simon Fraser University, reminds people of the foolishness we see going on right in front of our eyes with environmental destruction in the quest for riches. We simply must stand up together and do something about this in the playing field of lies and deception which seems all too often common practice to achieve financial goals in today's world. Lynne is a climate activist and in 2012 was arrested for the blockade of a coal train at Whiterock, an educated stand-up person who puts her body on the line for what she believes in !